Create delicious sauces for your meals with this Vigor 6 qt. stainless steel / aluminum clad sauce pan! This durable 6 qt. sauce pan is a great piece of cookware suitable for a variety of tasks, from creating or reducing sauces to cooking vegetables, and is built-to-last in your commercial kitchen. Constructed of durable, 22-gauge stainless steel with a straight-sided design, this sauce pan won't pit, discolor, or transfer flavors. Thanks to its 4 mm aluminum core, this pan attracts and distributes heat evenly and quickly for faster and more consistent results each and every time. I am using this 6qt sauce pan with lid in my personal kitchen. It is the perfect size for cooking my soups and letting the liquid cook down. It lays perfectly flat on my ceramic electric stove and heats evenly. Clean up is easy being heavy gauged. And like the directions suggest-just let it soak if needed. Looking forward to getting more Vigor cookware. Boasting an aluminum clad bottom and stainless steel sides, this Vigor 6 qt. sauce pan is a great piece of cookware suitable for a variety of tasks, from creating or reducing sauces to cooking vegetables. It delivers the fast, even heat distribution you need to keep up with demand in any kitchen and with the included cover you can tackle any recipe! I have two of these sauce pans for my small restaurant and they are perfect for what I need them for. Great quality at a great price. This is a great sauce pan that I bought and it is great at hold heat and it is big enough to cook the spaghetti sauce that my family so loves. I plan to purchase in a 4-6 quart next and look forward to many years of good use! I like this brand pots because they work on any heating element and heat up quickly and evenly. Don't waste your money on expensive pots and get yourself some of these. The 6 Qt. Stainless Steel/ Aluminum Clad Straight Sided Sauce Pan is a great quality sauce pan. It heats evenly and is heavy weight. It is great for residential and commercial use. Generally, I like the pot. It is solidly built, stainless steel, works well on my induction burner, and comes with a cover. For the price, it is a good value, but I do with that the pot had a better designed handle, because it is a little awkward to use. Similar to their other sauce pans, this one works great. Good on induction and on the stovetop too. Good size for a lot of tasks. Really like this pot. this is a good size clad sauce pan. it has good conduction and is solid. i wish it had a coated handle but that's okay. These are nice heavy duty sauce pots. The lids fit well and also seem quite sturdy. I purchased several for use in my catering kitchen. Perfect pasta pot for all your needs. The 6 quart capacity is a perfect size for a family of 4-6 and easy cleanup right in the dishwasher! Perfect size sauce pan to make small to medium batch sizes. Extremely well made and price is excellent! Can we use on traditional gas or electric cook tops, as well as induction cook tops. Very versatile. 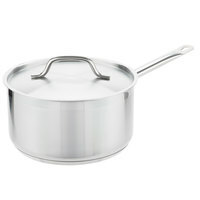 This 6qt pan is a great stainless sreel sauce pan. There are not hot stops when using on my gas range. This sauce pot even came with a lid. Great deal. Thanks,! This pot is surprisingly heavy duty. We used it today to make pralines and it preformed wonderfully. Such great quality! I would highly recommend it. Good sauce pan at an unbeatable price. Plus it comes with the lid as well. We used this pan a few times and it has held up so far. After searching for the perfect pots at thr best price, i finally find them. This pots are durable well built easy to clean and they feel very durable, i am happy with my purchase! Another great sauce pan. We prefer this one over the 4 quart, because it gives a larger base and heats faster. Super heavy for the price! Exceptional Quality! Great size! I would recommend these Stainless Steel/ Aluminum Clad Straight Sided Sauce Pans to anyone interested in purchasing at a great price point! We love these saucepans. They are very well made. The price is also really good. We keep coming back for more of these great items at great prices. This is a great sauce pan. The clad bottom retains heat well. Lots of sizes available to suit every situation. Price can't be beat. Holds up to use well. I use this pot to make buerre fondue, pomme dauphinse, or risotto. The handle helps me to keep the pot in motion while whisking with the other. These pans are quite impressive for the price. I wasn't expecting nearly the quality. They are quite heavy and well built. I have ended up moving them in as my primary pans and use them for everything now. The bottom of the pan has pitted and is starting to rust. It doesn't seem like it will be a major issue, but only time will tell. A little silly, but it's bigger than I was anticipating based on the picture (should have paid more attention to the 9.5 inch diameter). That said, it's a good pot for the price. As others mentioned, it is quite heavy and is hard (for me) to lift with one hand. Wish the end of the handle was more rounded/blunted because I end up balancing it against myself when carrying. Still, it's solid and an okay price. It works better on induction than other retail brands I've tried. Very good quality pan. Heavy bottom makes gives it a bit of weight, but that is not so much a bad thing. Works great on induction heat. I had previously purchased a larger size pot from this same series and was pleased with the heavy and solid construction. This one also is heavy and nicely balanced - although could do with a second handle on the side as it is very heavy when filled and thus rather difficult to move. I'm sure we will use the pot often in our busy kitchen. One thing I was hoping was to use it as a base for an occasional double boiler, but it is wide and shallow and therefore not the right size for that purpose or to nest another pot inside and cook or melt foods that way. These pans are the best for the price. When I received them, I thought that they were really big, but when I got into the kitchen, it was the exact size that I needed. They are big and sturdy and the finish looks good and professional. I am not disappointed. . This is a good sized pan, purchased to use with an induction burner. We have had no issues with this, and use this pan often. We are very happy with this selection of 6 Qt. Stainless Steel Clad Straight Sided Sauce Pan from Webstaurantstore. It is functional and just what we need. I really like this saucepan. It works great and has a nice, solid, heavy plated bottom to distribute heat. I was worried the handle would transmit lots of heat, but it stays pretty cool. A good value for the money spent, but I would not call it a high quality item. It certainly isn't a real cheap pot either. It is sort of a middle range type of stainless steel pot and gets the job done. The 6 quart stainless steel clad straight sided sauce pan is good. It is of a solid construction, so we are not worried that the handle will pop off while we are cooking. The price is great. This is a high quality, useful pot at a middle-price. The aluminum is thick enough at the base to evenly distribute heat, but does not go far up the sides. The stainless steel is not as smooth as higher-priced stainless products, but hasn't been a problem with our uses (which are mostly wet). I like that it comes with lid, but wish the handle came with a heat-resistant cover or was a more holdable shape. Great addition to our bakery kitchen. Heats nice and even and easy to clean. We use it to make caramel, sauces, fillings etc. We are thinking of ordering one for our home kitchen too. I am very pleased with this selection as well as the other two pans selected. They are as functional as I anticipated them to be. high quality construction. I've been looking at the retail type of pots and pans, caphalon, cuisenart, etc.... I always find gaps in where the handles connect to the pan and other flaws that make me walk away, plus they are very expensive. this commercial cookware is very inexpensive by comparison and the quality is so much better than the so called "high end" pseudo-commercial stuff. no need to ever look at the retail brands again, this is great!